Gordon K. Hirabayashi, who challenged the constitutionality of the internment of Japanese Americans during World War II, passed away on Monday. A resident of Edmonton, Alberta, Canada, he was 93. 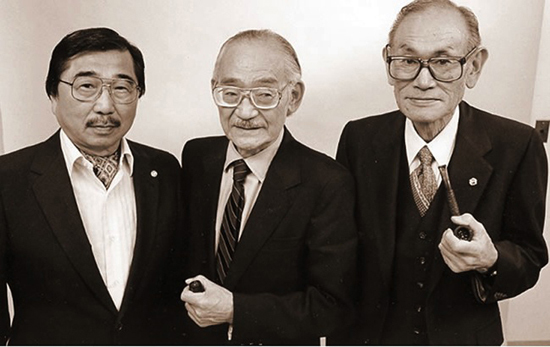 Hirabayashi is remembered along with Minoru Yasui (1916-1986) and Fred Korematsu (1919-2005) for violating curfew and exclusion orders imposed on West Coast Japanese Americans and appealing their convictions all the way to the U.S. Supreme Court. The court ruled against them, accepting the government’s argument of military necessity. Through a legal maneuver called writ of error coram nobis, the three cases were reopened in 1983 by a group of mostly Japanese American attorneys on the basis of newly uncovered documents showing that the government knew Japanese Americans did not pose a security threat but hid that information from the court. The convictions were overturned, thus strengthening the movement to obtain redress for former internees. A biography of Hirabayashi, to be published by University of Washington Press, is being written by his nephew, Lane Hirabayashi of UCLA’s Asian American Studies Center, and brother, James Hirabayashi, former dean of ethnic studies at San Francisco State University. “Gordon believed very strongly that his war-time Supreme Court case, and his 1980s coram nobis case, were both the JA community’s and the larger American public’s cases,” Lane Hirabayashi told the Rafu Shimpo. “He never felt, that is, that these were somehow exclusively his own. My understanding is that he remained profoundly grateful to all the individuals, networks, and the organizations that supported him, and never forgot that these included people of all colors, from all walks of life. The coram nobis cases were the subject of an Oscar-nominated 1985 documentary by Steven Okazaki, “Unfinished Business,” and two books, “Justice at War” (1983) and “Justice Delayed” (1989) by Peter Irons, who led the effort to reopen the cases. Hirabayashi’s story has also been told in a 1992 documentary, “A Personal Matter,” and on stage in R.A. Shiomi’s “Play Ball” (1989) and Jeanne Sakata’s “Dawn’s Light,” first performed in 2007 at East West Players. Born on April 23, 1918 in Seattle, Hirabayashi was the oldest of five children. His Issei parents were converts to Christianity and belonged to a Protestant movement called Mukyokai. He was active in the Boy Scouts. As a student at the University of Washington, he belonged to the student YMCA and attended a YMCA/YWCA summer training school in New York. There he became involved in pacifism, and decided to seek conscientious objector status. He found Quaker beliefs appealing and applied for membership in the University Friends Meeting. When Pearl Harbor was attacked, Hirabayashi was worried about his parents and other Issei. “Since they were legally ineligible for American citizenship, war with Japan instantly transformed them into ‘enemy aliens.’” he said. Hirabayashi had been ordered to a Civilian Public Service camp in Oregon by the local draft board, but the Selective Service reclassified all draft-age persons of Japanese ancestry as aliens ineligible for conscription, so his order was canceled. “After the curfew order was announced, we knew there would be further orders to remove all persons of Japanese ancestry from the West Coast,” Hirabayashi said. “When the exclusion orders specifying the deadline for forced removal from various districts of Seattle were posted on telephone poles, I was confronted with a dilemma: Do I stay out of trouble and succumb to the status of second-class citizen, or do I continue to live like other Americans and thus disobey the law? “When the curfew was imposed, I obeyed for about a week. We had about 12 living in the Y dormitory … and they all became my volunteer time-keepers. ‘Hey, Gordy, it’s five minutes to eight!’ And I’d have to dash back from the library or from the coffee shop. “One of those times, I stopped and I thought, why the hell am I running back? Am I an American? And if I am, why am I running back and nobody else is? I think if the order said all civilians must obey the curfew … I might not have objected. But I felt it was unfair, just to be referred to as a ‘non-alien’ — they never referred to me as a citizen. Although he regularly stayed out past 8 p.m., nothing happened to him. When the exclusion orders came, Hirabayashi, who had joined the newly formed American Friends Service Committee, helped Nikkei families prepare to be shipped out, particularly those whose fathers/husbands had already been taken away by the FBI. “I fully expected that when the university district deadline came up I would join them,” he said. “Those who saw me waving them goodbye all expected to see me within a few weeks at the most. About two weeks before my time came up, I said to myself, if I am defying the curfew, how can I accept this thing? This is much worse, the same principle but much worse in terms of uprooting and denial of our rights, and the suffering. His supporters, including Quakers, ministers, professors, businessmen and a state senator, formed the Gordon Hirabayashi Defense Committee and sought to turn his fight into a test case. When he turned himself in, he was offered a deal — charges would be dropped if he would report to the Puyallup Assembly Center. “I told them that not only would I refuse that offer, but they were proposing to do something illegal,” he said. Instead, Hirabayashi was held in the federal tank of the King County jail in downtown Seattle from May to October. His lawyers argued that he wasn’t given due process as a citizen and was subject to exclusion orders solely on the basis of ancestry. The judge denied these challenges. Judge Lloyd Black told the jury that the curfew and exclusion orders were valid, and the only question was whether Hirabayashi had complied with those orders, so the verdict was a foregone conclusion. Sentenced to 30 days in jail for each conviction, Hirabayashi asked that 15 days be added to each count so that he could have a 90-day sentence, which would allow him to serve at a work camp instead of behind bars. Pending appeal, he was allowed to work for the AFSC in Spokane, which was outside the exclusion zone. When the Supreme Court ruled against him, he had to serve out his sentence. However, the only federal work camp available was in Tucson, Ariz., and the FBI did not have the money to send him there. Hirabayashi recounted, “I said, ‘What if I go on my own to Tucson?’ And [the FBI agent]said, ‘If you want to do that, it’s okay with me. In fact, I’ll write a letter for you, in case somebody gives you problems.’ It was against my principles to pay my way to prison, so I hitchhiked. This is 1,600 miles away, down the middle of the mountain states, during gas rationing, so there’s not many cars on the road, and traffic is slow. I stopped in Idaho to visit with my parents for a few days and then I stopped at Salt Lake City to visit friends, and finally got to Tucson after two weeks. “I went to the U.S. marshal’s office and told them I was reporting to serve my sentence. This marshal looked in his papers and said, ‘We don’t have any record for you here. You might as well turn around and go back. You’re free to go.’ I said, ‘Look around, there must be something. If I go, someday you’re going to find those papers and I’ll have to interrupt what I’m doing and come back. So I might as well get this over with.’ … They found my papers at the bottom of the pile. Upon his return to Spokane, he received the same loyalty questionnaire that was imposed on Japanese Americans in the camps, asking if he was willing to renounce allegiance to the emperor of Japan. He called the question discriminatory and also refused to report for a physical, thus getting a one-year prison sentence. With the war over, Hirabayashi was reunited with his wife and twin daughters in Seattle. He earned a Ph.D. in sociology and accepted an assistant professorship at the American University of Beirut in Lebanon. After spending most of the 1950s in the Middle East, he took a teaching job at the University of Alberta in Canada, where he remained until his retirement in 1983 at age 65. In 1985, Judge Donald Voorhees vacated the exclusion order conviction, but upheld the curfew conviction, prompting Hirabayashi to appeal. The government also appealed on the exclusion order. “We had arguments before the appellate judges in March 1987, and they handed down a unanimous opinion in September, upholding Judge Voorhees on the exclusion order and also striking down the curfew conviction,” Hirabayashi said. “So I finally got vindication … although I’m a little disappointed that the Supreme Court didn’t have a chance to overrule the decision they made in 1943. 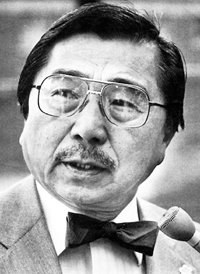 Hirabayashi spoke extensively on civil liberties across the country. In 1999, the Coronado National Forest in Arizona renamed the former Santa Catalina Mountains prison camp, where Hirabayashi served his sentence, as the Gordon Hirabayashi Recreation Site. When Hirabayashi was honored by the University of Washington in 2000, his son Jay choreographed a dance piece, “The Believer,” dedicated to Japanese Americans and Japanese Canadians who suffered undeserved hardships during and after the war. Jay Hirabayashi announced that a Quaker memorial meeting for worship will be held Friday at 1 p.m. at the Edmonton Japanese Community Association, 6750 88 St. Northwest, Edmonton, AB T6E 5H6; (780) 466-8166. In lieu of flowers, donations can be made to the Capital Care Lynwood, where Hirabayashi was cared for during the past three years, or to the Gordon K. Hirabayashi Scholarship Fund within the Department of Sociology at the University of Alberta or to the Gordon K. Hirabayashi Endowment Fund at the University of Washington. Donations in lieu of flowers may be made in Esther Hirabayashi’s memory to the Canadian Association of Medical Teams Abroad, c/o 103 Laurier Drive, Edmonton, AB, Canada T5R 5P6. At her request, no service will be held. Gordan Hirabiyashi was a friend of my mother growing up and we would hear bits and pieces about him but until reading about him never knew what a hero he was to all of the people who were in internment camps. Thanks Gordan!